What is the relationship between book and body? This lovely text, both spare and voluminous, invokes an intimate register in which letters become liquid garments. Vogel adeptly “lets the ledge of a sentence wax.” Her white space brims. Her parentheses cup breath to your ear. This book invites you to stand in an alphabetic current, abandon the distance between reader and text, pet words with your eye. Between Grammars transcribes lament for the limits of language and simultaneously conveys a hopefulness for poetry as an innately connective impulse. 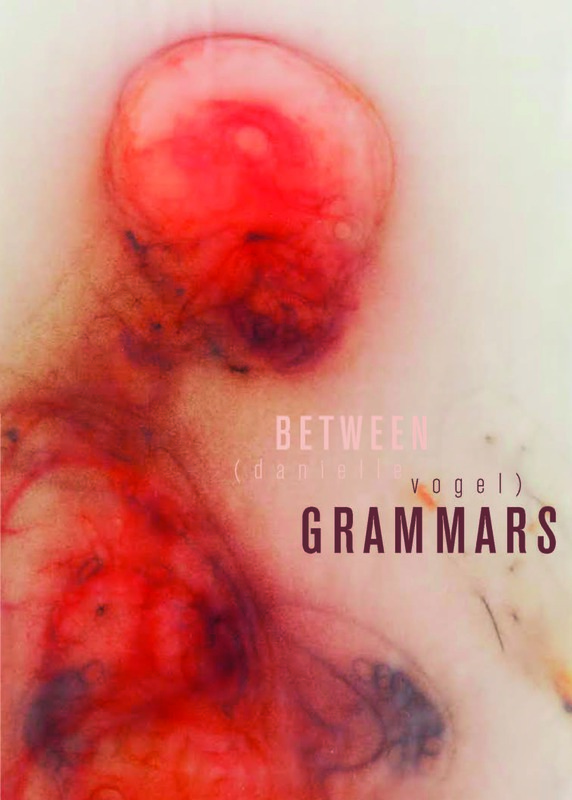 Because “a body loosens itself across an alphabet,” because “an absent word unsettl[es] the collarbone’s concavity,” because “the vowels layering, breathe,” Danielle Vogel’s ravishing and profound work resides in one as a thrilling visceral experience. Never has a reading encounter felt so fully embodied—the vibration and motions and shapes of language inside, transforming the day, long after the book is closed. You arrive at that place between grammars to find enabled an occasion of sound forms, even as the continuity of vision tells you were meant to emerge as another’s body. So your speech, prompted by that of the poet, breaks the surface into a unit of lines compressed to convey the encounter of thought animated as a “receptacle of noise,” now pressed against your measured edge, first at the skin, then along the oblique dissolution of the person you were, divided now by the reader you’ve become: against the undertow, letter’s liability, knob of your spine, an overflowing. Such allegiance to the dubious figure receded and re-emerging herein makes the duration of these pages a singular affirmation. Syllables incline the volume, effervescence of your tongue over these markings, expectant as lips are to arrival. I felt very much in an experience in Between Grammars, as if I was relearning to read, but not just inside my own mind. I encountered reading. Between Grammars does something no other book does: it “floods” you with an image of itself. It moves through itself as a wave. You as the reader are in the wave too. I think this is miraculous. First in a trilogy of texts, Between Grammars is a book-length narrative poem composed of prose-fragments that investigates the boundaries between books, language, and the bodies that read and write them. Within these pages, language becomes a living organism as “Grammars cohere, lap, unfold. A slanting field upon the other.” This text explores the porous architectures built between people and their vocabulary — how we meet inside these architectures and what we’re able to exchange there. As we read, “Language tides the skinline,” collapsing the distinctions between self and other. Danielle Vogel is an artist and writer who grew up on the south shore of Long Island. She is the author of Narrative & Nest (Abecedarian Gallery 2012) and lit (Dancing Girl Press 2008) and has exhibited her work at RISD Museum, AS220 Gallery, The University of Arizona’s Poetry Center, and Abecedarian Gallery. She has taught Poetry and Fiction at Brown University, Wesleyan University, The University of Denver, and Naropa University.